While visiting Teignmouth I came across the most gorgeous shop. Called Bare Necessity, it is a haberdashery (not many of those around nowadays). When you walk inside you are hit by a rainbow of colour, with hundreds of rolls of ribbons lining the walls. 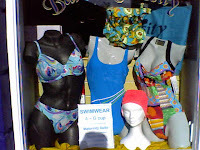 The shop also sells wool, swimwear, lingerie and the most fantastic selection of proper swimming hats in all manner of colours - including the ones covered with flowers. Scrum! 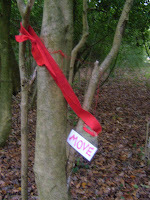 Well it wasn't exactly a big surprise, but down at the woods it was rather strange to come across a tree dressed with a red sash and a sign saying MOVE. On the other side of the sign was a red heart. What does it all mean? Who knows? Sun. Heat. Temperatures of 23 degrees C. A normal October Sunday - not. But since when is the weather 'normal' any more? We spent the day soaking up the sun on the beach at Bantham. 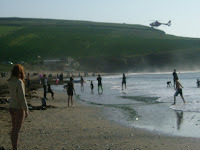 There was a stir of excitement as the air ambulance landed - it stayed for some time and then left without apparently rescuing anyone. Apples are continuing to play a prominent role - well, it is that time of year. Today it was all hands on deck to press them for juice and cider. 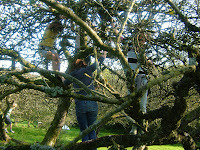 All ages, shapes and sizes gathered for work and chinwag, to get the apples in, crush them and then bottle the juice. There were numerous Newtonian moments when the trees were shaken and those below suffered direct hits. I rarely do the domestic goddess act, but today I did have a very satisfying culinary moment. 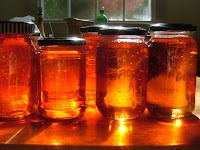 Having gathered crab apples (free) at Newbridge at the weekend, it was time to make apple jelly - but with a kick. At this point I must credit my Italian friend Sandra who had the idea of putting chillis into this very English condiment. She gave me some of hers last year and it was so unusual (and delicious) I was determined to replicate it. I ended up with 11 jars at a total cost of approximately £2 (the sugar). 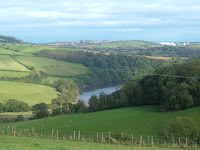 Cycling out from Totnes towards Sharpham along the Dart proved to be something of a challenge...there was considerable huffin' and puffin' at the numerous hills...and then the glorious views took our breath away even more. We stopped at the Durant Arms in Ashprington where we refuelled on coffee and a delumptious apricot frangipane.